getting up the Wall without heavy armor, a weapon to carry or a war going on is a challenge already ! As you can see, The Great Wall of China is a challenging defensive work and the wall is quite steep. Most Tourists probably never make it here. Inclinations of almost 70% are NOT unusual at the Great Wall of China. It was an excellent defensive position, still is ! The Badaling Wall watches over the JuYongguang Mountain Pass in the Jundu Mountains, the main Pass leading directly to Beijing. On the Northrn Section, the Great Wall crumbles after some miles. It ends here in some unrestored rubble destoyed by local cavitations, rockfalls or simply the pillaging by local farmers who can and have often used bricks from the Wall for personal use. A high fence warning of danger stops any further progress and there is no option but to return on ones path. From here you will have to return to your coach, ... all the way back. run through Badaling Village in the Pass down below, but this parking on the hillside is where you get off your Coach for a visit to the restored Wall of Badaling. From here you can see the legendary Great Wall of China. It is possible to climb the Great Wall in 2 directions. North and South. As the Southern the direction draws the most crowds we go North. The Great Wall of China was first constructed around 200 BC by the short-lived Ch'in Dynasty and was expanded by the Han dynasty to a whopping 6700 miles length. This was the longest construction in human history, protecting the chinese heartland and leading to a blossoming of the Silk Road. As a result the Han flourished and the succeeding Tang Dynasty is known as China's Golden Age. In around 1225 AD the mongol armies of histories most brutal warlord arrived at the Gate of Badaling. What happened next was an event unequalled in Chinese History. the ancient brick-making and masonry processes of the Ming Dynasty builders. During their experiments the rebuilders found out that the cementing of the Great Wall is many times harder and more durable than what is commonly used. 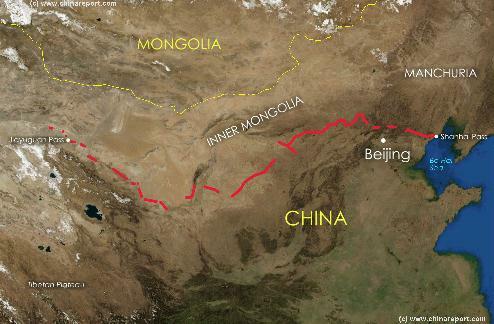 Historically the Great Wall was not an all-brick structure, however. This was only the case for the Ming Dynasty. During the Ch'in Dynasty that started the Wall in 220 BC, main sections were constructed of locally available materials and compacted earth. The Han and Tang Dynasty Wall was likewise only constructed from mud-brick where available. Western China. Many of these parts of China can be considered remote even today. The original Badaling Wall has been built High in the Jundu Mountains, North-West of Beijing, where it served to protect the Capital City from attacking tribes in the North. The Badaling Pass and Gate was only one passage through one of several layers of the Great Wall surrounding and shielding the Capital. Watch Towers are always higher than the surrounding Wall sections and they can be seperately sealed off from attackers. In such case the soldiers would climb to the top floor of the tower for best defense, using among things the powerful chinese crossbow to strike back and hold out. 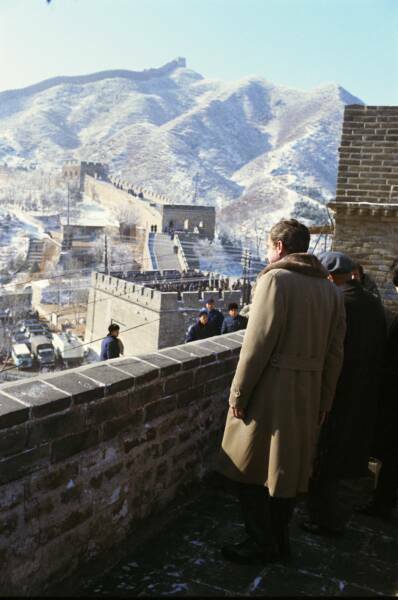 The Great Wall was heavily fortified and any attacker would face a serious up-hill battle before conquering The Wall and marching on to Beijing. In case of an approaching enemy a ready-made fire on top of the tower would be lit to signal the Fort that danger was coming. The signal would also be copied by surrounding towers. For this purpose the soldiers would collect wolves dung to burn as it gives a thick grey-white smoke. Of course a messenger would also be sent , but if he became incapacitated or was intercepted behind the lines , the message would always get through. Reinforcements could always be sent from the Garrison at Fort JuYongGuang or even from the whole of China , sending all signal fires along The Great Wall of China alight. The Wall continuously follows the Mountainridge. Steep declines are on both sides. The great wall has watchtowers at every 150 meters, the lower half of which are living spaces for the stationed Soldiers. The Wall itself is 7 meters high on average. Watchtowers are 12 meters above the surrounding hillsides. During the Ming Dynasty (1368 AD - 1644 AD), that had had to evict the Mongols, the Great Wall of China was restored in function and expanded to its maximum length, while changing methods of construction. The result was a virtually continuous brick wall running around 8000 miles. The Last Watchtowers, near the Northern End of The Wall at Badaling look out over misty and snowy mountain tops and eery quiet takes hold here, especially in winter. There is nothing here but great wall. After this point the Wall crumbles to it's historic remains that carry on along the mountain-ridge. What !?!? 30 Minutes to get from here to all the way down below there ?!? Ooooooh No... ! ! 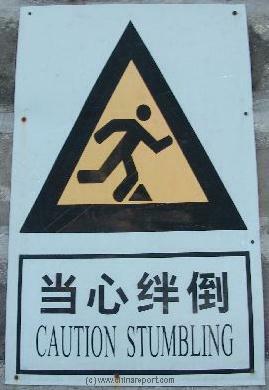 the entire lenght of the Wall, even at Badaling is Not for whimps ! Come with decent shoes at least ! see, view and visit The Great Wall of China near Beijing , as it is the easiest reachable point at some 50 to 60 kilometers driving distance from Tian An Men Square. The Burial Tombs of the Ming Dynasty Emperors are nearby in a large valley at the foot of the Jundu Mountains. Other Great Wall of China Scenic spots include the more remote Simatai and Mutianyu locations at a considerable distance from Beijing City. takes a while to get there though. Although several new ring roads have been constructed around Beijing, and a first class highway that leads to Badaling, traffic usually suffers from congestion. For excursions beyond the Badaling Wall, into Hebei Province, arange your own transport and study your map of Hebei carefully ! some 58 Km outside Beijing proper. Car Parking, Train Station, Area and All Walkable Wall Sections included. 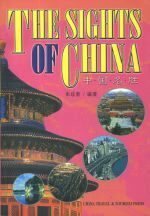 Source Book "The Sights of China"
In 1225 AD Genghis Khan the infamous arrived with his Mongol Armies at the gates of this Great Wall. On his way to conquest of East and Central Asia and the founding of the Mongol Empire, the Great Khan was temporarily halted in his advance by the Great Wall of China. The leading Chinese General of Jin Dynasty China which held rule over North China at the Time, had the central Badaling Gate solidly closed with poored Iron to stop the Gate from opening before the Giant Mongol Army. A stale-mate at the Badaling Wall ensued. The Mongols failed to breech the Wall for Months, until Genghis Khan conceived a plan. Outflanking Fortress JuYongGuan with his horsemen, the mongols penetrated the Great Wall in a nearby area where it had fallen into ruin and disuse. Not expecting an attack from the rear, the defenses of Fortress JuYongGuan were overrun and the Mongols cleared the Gates of The Great Wall. Riding down from Badaling the huge Mongol army overwhelmed the Chinese Capital of Dadu (currently Beijing), raising it to the ground in 1237 AD. Dadu would be rebuilt as Khanbalik, the City of Khans, while the Mongols further established their Rule over the Han Chinese. Although Jin China would be annihilated by 1259 AD, the Song Dynasty in south China would hold out for a longer time. Eventually, the Song lost their Capital in 1273 AD. The Chinese were ruled by Foreigners in their own land. The Mongol Yuan Dynasty was born when Kublai Khan was crowned Emperor in 1279 AD. A view of the surrounding mountains covered in snow on approach to the Badaling Great Wall Site (Januari 2000). 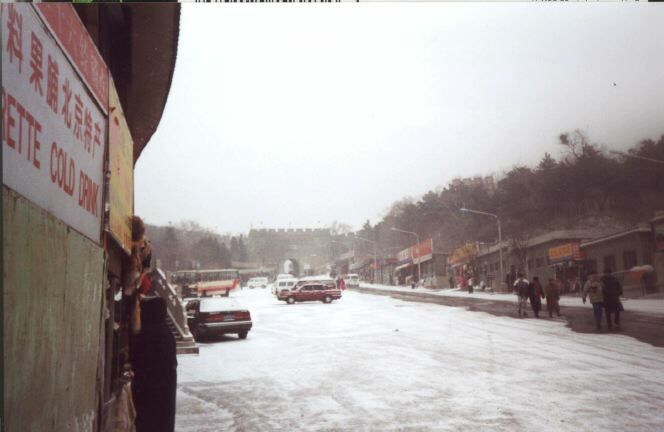 The underdeveloped parking lot in Januari 2000. Much has changed here since. Greater flocks have come to the Wall and a New Monument has been added near the parking zone and nearby highway. Many Tourists and a mass of Flags await Tourists come to the Badaling Great Wall of China. 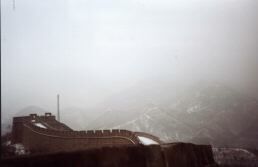 First views along the Great Wall - the Great Wall stretches over Mountain Ridges to disappear in snow and mountain mist. Walking along the Great Wall - Hilltop after Hilltop and watchtower after watchtower emerge from the clouds in an endless row. The surrounding Mountains are eery quiet. Catching the highground this watchtower is one of the more spectacular climbs on the Badaling Wall. Steep inclines lead up to a mountain-top overlooking the snowed Valley. Down below the Wall - the mountianpass road to Beijing and the Political Capital of China. View through a watchtower window - mountains across the valley lost in clouds and snow. More watchtowers on an uphill path on the badaling Great Wall of China. Behind the Wall, a tree-rich slope downhill. In front of the Wall - barren rocks on a steep incline. Badaling Great Wall of China continues through snow and clouds along the mountain ridge. Some sections have crumpled here and in the distance it seems to end. View through a watchtower window at Great Wall ending. This section may now be restored. 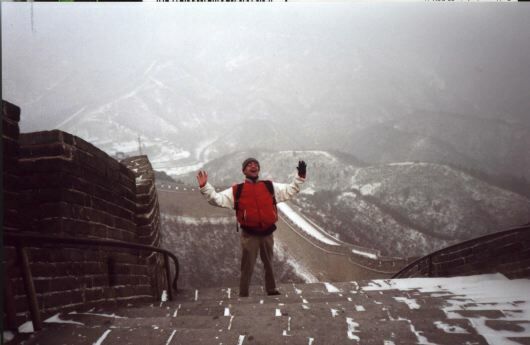 End of North Section on the Great Wall of China in januari 2000.The crumbled wall continues still for miles along ridges in the distance. of China during the Ming Dynasty. Passes on the Great Wall included. strong, can be extremely cold and have sometimes been fatal to unprepared visitors. 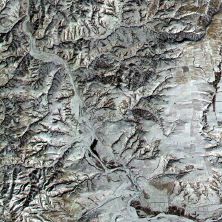 Click Map to view Simatai Valley Site. Remnants of other layers arching around the City of Beijing can be found in North and West-Hebei Province, and in neighboring Western Shanxi Province. Badaling was however a Main Gate, and was the most fortified position on the Great Wall of China immediatly North of Beijing. As a main passage through the Wall, Badaling was reinforced by a Garrisoned Fortress. The name of the Badaling Fortress is Juyongguan. From here reinforcements could be dispatched on a short notice. Fortress JuyongGuan, famous in chinese history, is located a few miles back from the Badaling Passage. The Badaling Section of the Great Wall is a restored section, one of the first to be reconstructed in the early 1960's. Today it is a big and truely worldfamous tourist attraction. Hundreds of thousands flock to this site during holiday seasons. In summer one can hardly move around here. Outside of Season your luck could be better. Climbing the steep Wall one has an excellent view south along the Great Wall at Badaling. The Badaling Pass thus forms the Border between Beijing City Province and Hebei Province. After the year 2000, the quiet Badaling Village and immediate surroundings have changed considerably. 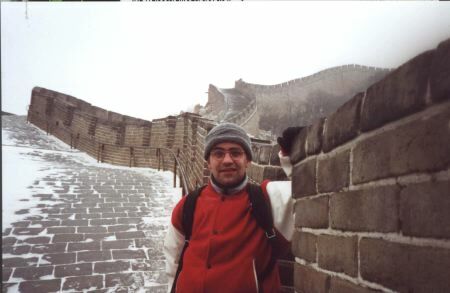 In 2002 a Monumental Wall was installed, officialy to honor the historic significance of the site and combat great wall graffiti, but in reality it was mainly done to make the site visually more attractive to newly affluent local tourists in search of entertainment on their days off. Leave your mark on the Monument Wall if you feel a need to do any "tagging" and get it out of your system ! One of the other recent additions to the Area is The Badaling Wild Animal Park. Find it at the foot of the Great Wall of Badaling Site immediatly across from the Main Parking Lot and Entrance. Mongol Conquest starting in the Year 1206 AD, when Genghis Khan first united the Mongol-Turkic Tribes of Mongolia and Lake BayKal becoming Great Khan. The Timeline continous through the year 1219 AD, the year 1223 AD taking Transoxiania, 1227 AD, 1237 AD when the Northern Jin Dynasty of China was annihilated, 1259 AD conquering ancient China above the Jiangste River and 1279 AD when all of China was taken and the Yuan Dynasty Eastablished under the Kublai Khan. Last is the Year 1294 AD when the Mongol Empire reached its largest geographical size and Zenith, 22% of world land area, but through lack of central leadership and over-expansion fragmented into 4 large parts, then imploded upon itself. Sound Effect "Wind Howling Heavily". A Full Google Earth Supported Map of JiaYonGuan Pass by Google.com. 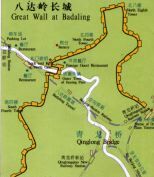 Adjacent Map gives direct access to Badaling + Pass Map by Google Earth.